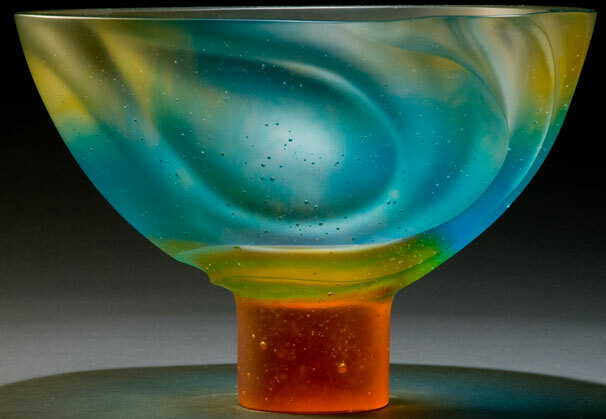 Brian Russell, already a recognized metal artist and woodworker, began exploring the possibilities of lost wax glass casting 13 years ago. 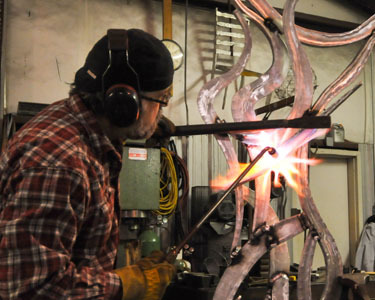 Today, he creates private and public sculptures that marry the lyrical line of forged metal with the luminous beauty of cast glass in his rural Tennessee studio. 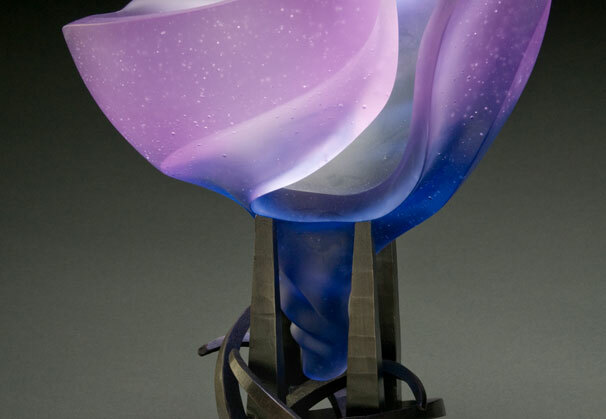 Russell is represented by Marta Hewett Gallery, Cincinnati, OH, where his solo exhibit runs February 8 - March 23. 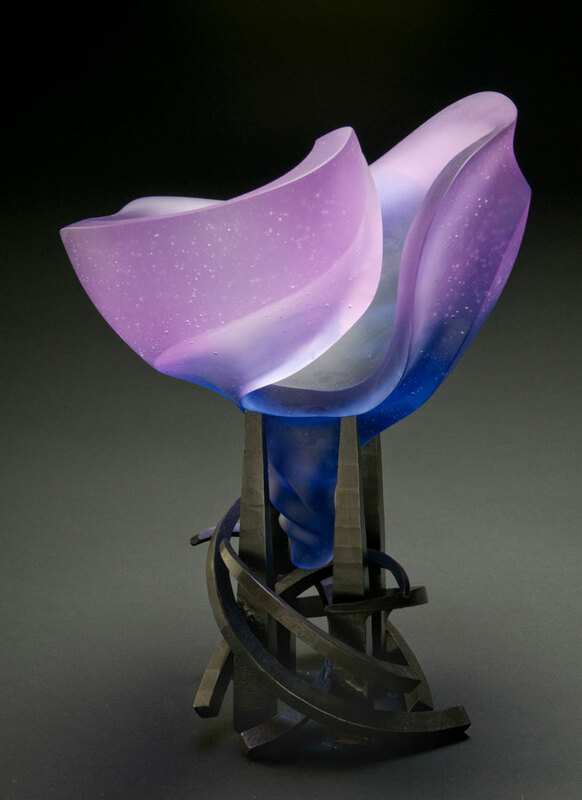 In 1999, Brian Russell, already an accomplished artist working with metal and wood, began experimenting with the ancient technique of cire perdue, or lost wax casting, traditionally a method of casting metal. 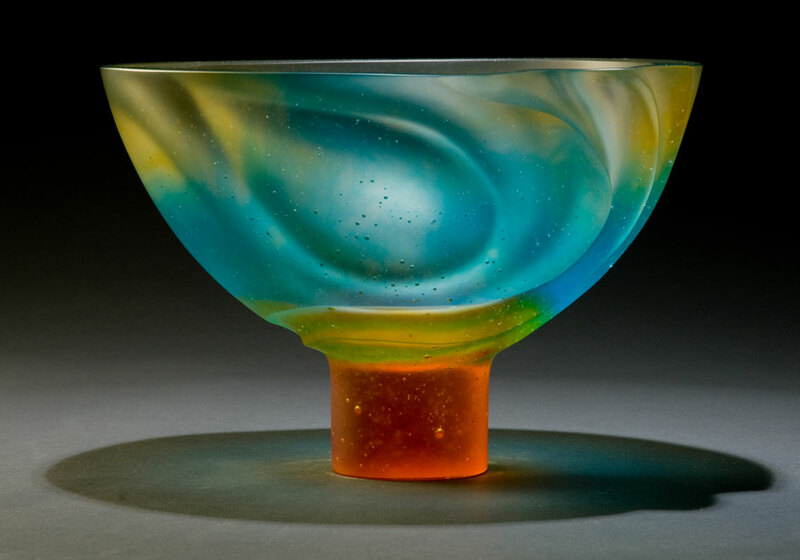 While in New Zealand, Russell happened upon a group of artists using the lost wax method to cast with a special crystal composite produced in Auckland. 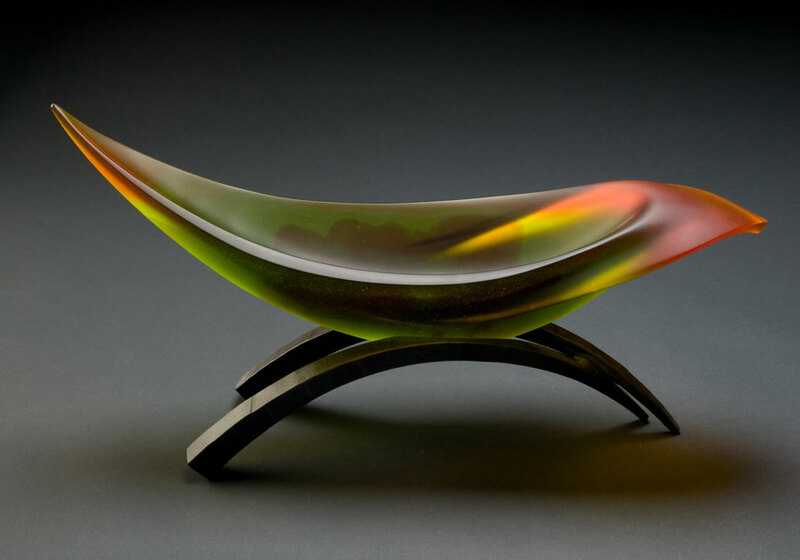 Applying his knowledge and skills in metal working and casting with his vision of art as beauty, Russell has developed a distinct style that celebrates light, color, line and form by creating works that capitalize upon the inherent qualities of glass and metal. 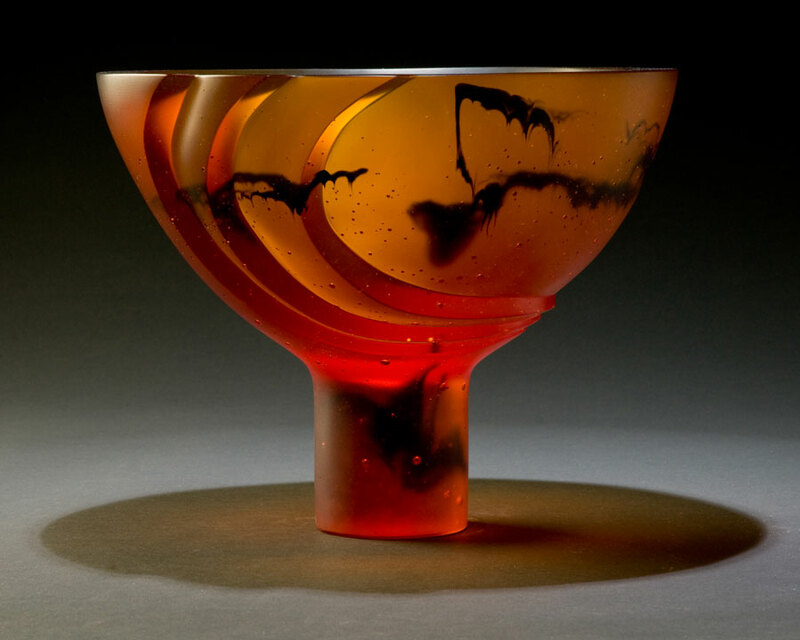 Mathematics of natural form and science continue to influence Russell’s work. His multi-media background, tenacity of vision and adherence to the formal tenets of good sculpture result in the creation of works of remarkable beauty and power. 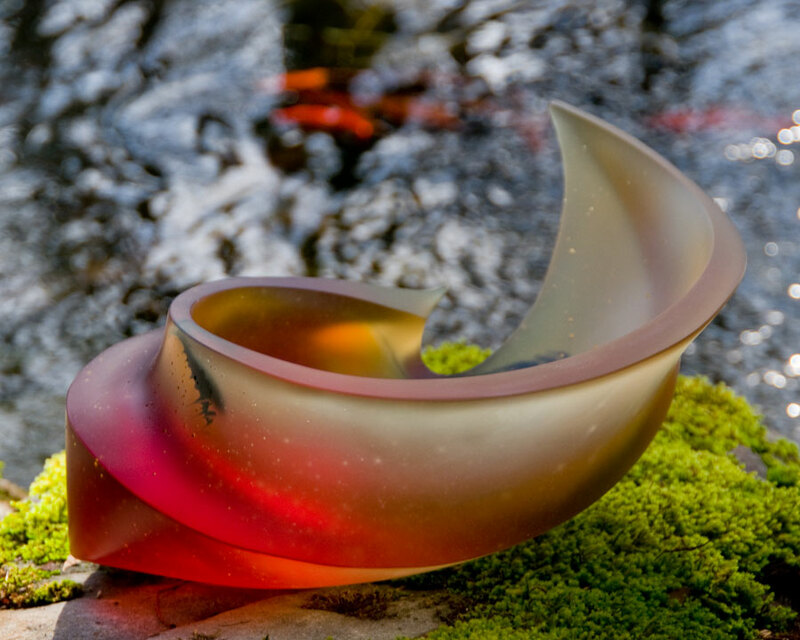 Brian Russell’s fondness for nature’s complexity and patterns is evident in his sculpture. 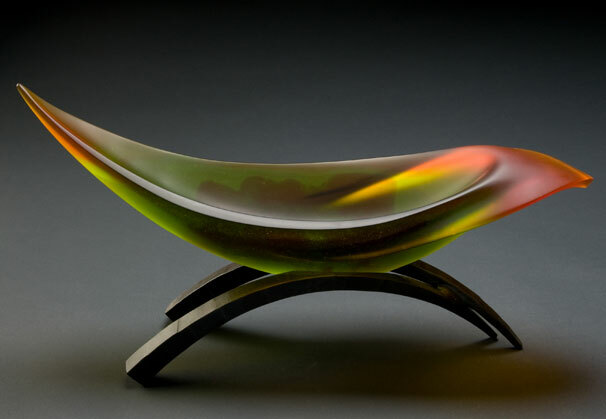 While increasing technical skill with the glass over the past 14 years has been key to the development of Russell’s work, it is his ability to manipulate the wax that allows for the subtle transitions that occur in his forms. 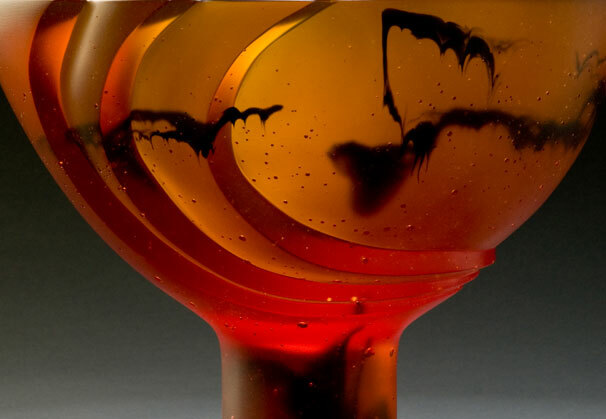 Russell explains that his vast experience with woodworking directly affects his ability to carve and achieve shifts from broad planes to paper thin edges within the wax. 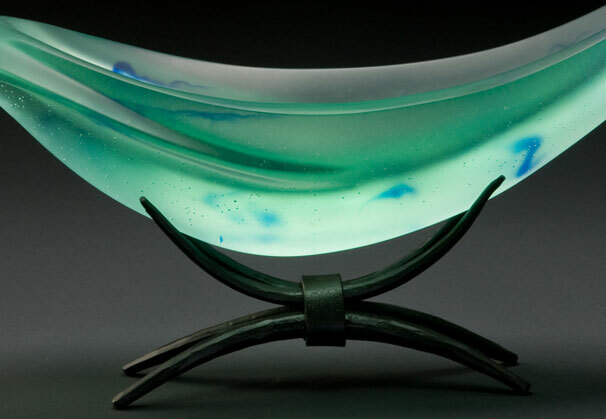 Subtle changes in the transparency and depth of cast glass color occur as forms shift from dense interiors that wrap and overlap to thin outer edges. 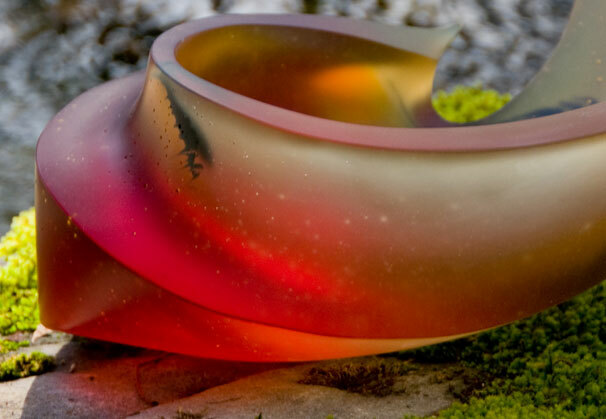 The metalwork in all of the artist’s sculpture, whether forged steel or fabricated bronze or aluminum, comes as a response to the glass. 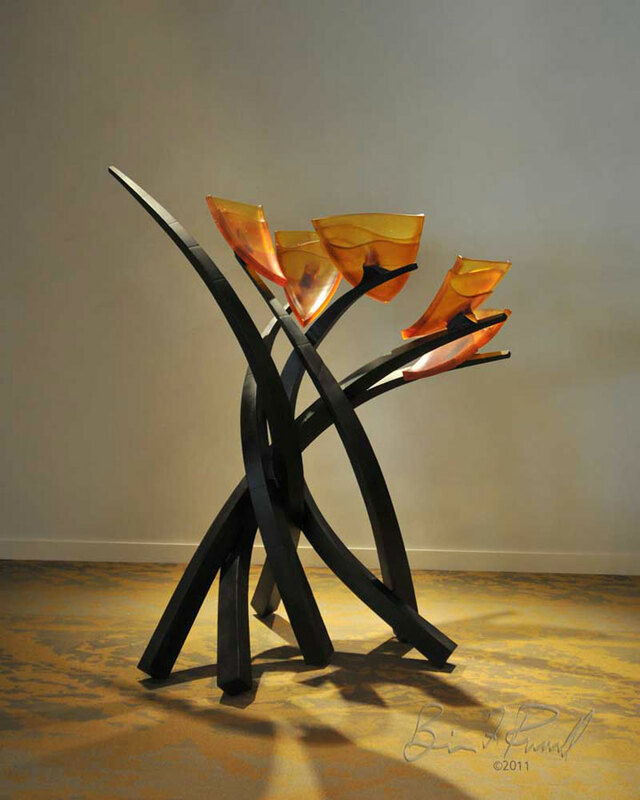 Twenty-five years of blacksmithing experience is evident as elements of forged metal caress and cradle the vivid glass elements. 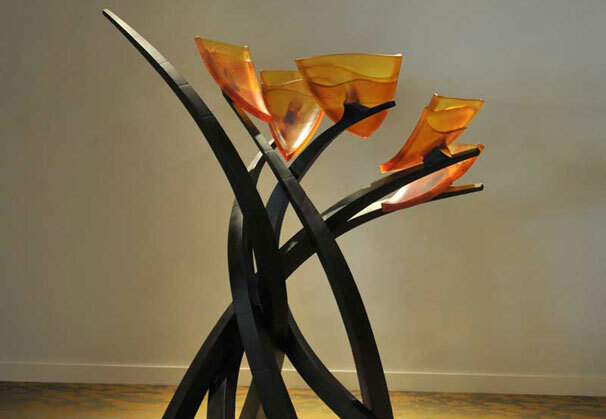 The combination of both metal and cast glass also allow Russell to create stunning pieces on a monumental scale. 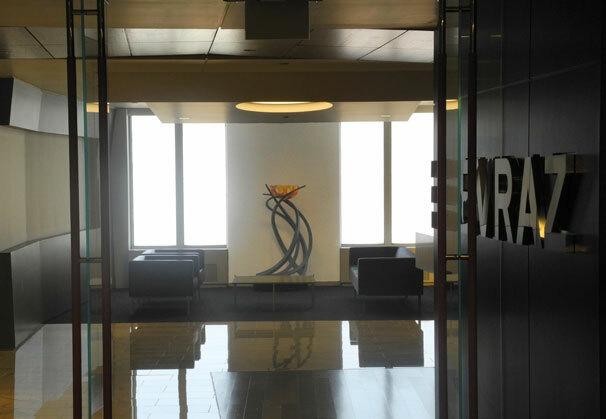 Large, public works have been commissioned most recently by SAS in Cary, NC, and Evraz Steel in Chicago, IL, for their corporate offices. 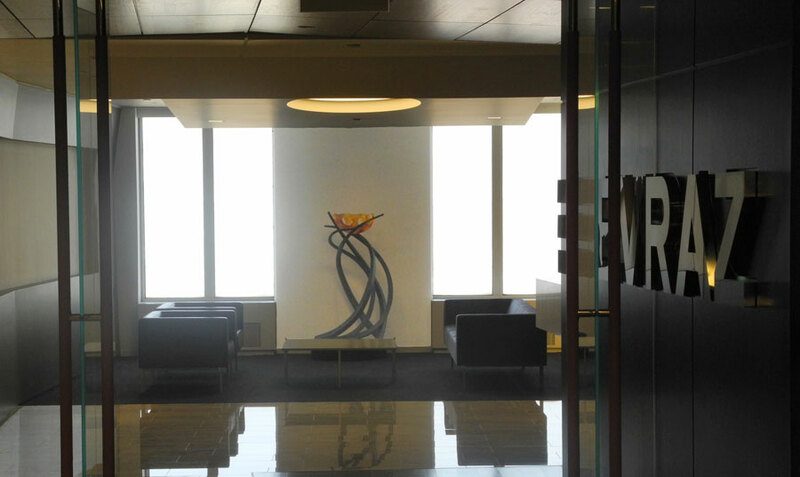 Works by the artist are also included in the collections of HSBC Bank; Qatar; First Tennesse Bank, Memphis, TN; Lark Creek Steak, San Fransisco, CA; and Energy Capital Partners, New York, NY; as well as outdoor park and civic settings around the country. 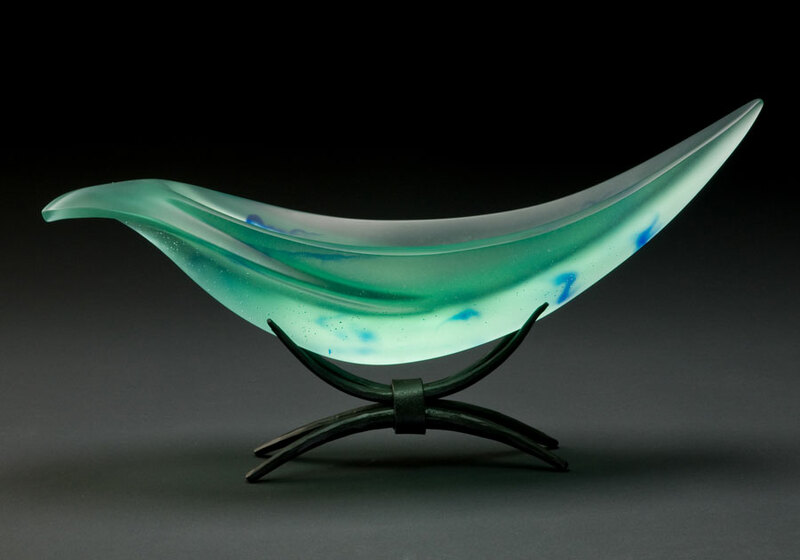 We are grateful to Marta Hewett Gallery, Cincinnati, Ohio, for providing the materials for the Artist of the Month.